Brining serves to purposes - 1. to intoduce more liquid into the meat so as it cooks it doesn't completely dry out if you overcook it slightly, 2. intoroduce some flavor into the meat. I have an article on brining if you want more info. 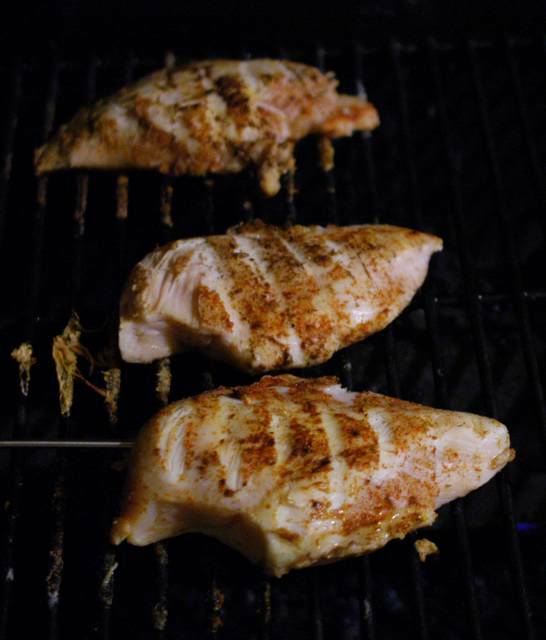 If you don't have a grill, you can broil the chicken under your oven's broiler, or pan fry it. Cooking times will vary and the final result will be a bit different (especially if the chicken is allowed to sit in it's own juices while cooking. What if my breasts have skin and bones? Should I grill them with the skin up or down first? I like the skin when roasted, but have had a problem with the skin charring on the grill. I'm trying to picture brining on the molecular level (can't help it, I'm a chemist). Do you think salting the chicken, i.e. without the water, will produce the same effect? I saw Maddhur Jaffrey do this with shrimp whilst rinsing them throughly before cooking. I tried it myself and it transformed the texture of the shrimp. It gave a kind of crispiness or snap if you will that you don't get otherwise. A good experiment to try: chicken breast in varying amounts of salt and water. I'm trying to picture brining on the molecular level (can't help it, I'm a chemist). Do you think salting the chicken, i.e. without the water, will produce the same effect? I wrote an article on brining a while ago that might help explain how brining works. Salting a chicken (without water) goes a long way to providing flavor, but you can't do it too long or the outer areas of the meat get too salty while the interior stays about the same (unless you cut it into thin pieces). The texture of the chicken also changes a little. Brining works well for larger chunks of meat because the lower concentration of salt allows the salt to penetrate at a slower rate and results in a more evenly salted interior. I landed on your site in a desperate search for a way to take frozen skinless chicken breast (the kind you pick up at your local BJ's) and do something decent with them on the grill. I am NOT a good cook, as my husband and kids can attest. What a shocker when they turned out to be juicy, tender, flavorful ... absolutely perfect! Even my picky teenage son raved about them! I didn't actually follow the recipe, but the basic concept must have been there because they turned out so well. When I found your site, the breasts were already soaking in a marinade of olive oil, sea salt and some leftover homemade honey vinaigrette dressing that no one liked. They soaked for about five or six hours at room temperature and were still chilled when I put them on the hot grill. What I believe was the key was NOT OVERCOOKING them. 1. Include grams instead of cooking measures... accurate digital scales make this easy. 2. What is the concentration of the brine - in grams per cc? 3. It might be practical to use non contact IR thermometer reading for chicken breast internal temp ... this is somewhat dependent on the emmisitivity of the material being measured, but might be handy - perhaps someone has done the correlation between IR reading and internal temp. Keep up the good work... a proper recipe and equipment should give good results every time. You cannot use an IR thermometer to get an internal temperature. Can you brine for a few hours and then rinse and then put chicken in a tandori marinade and finally grill? is that too much to do to the chicken? You can do that... but why not add some salt to the tandoori marinade? The yogurt base of the marinade should work well with the salt to add flavor into the flesh of the chicken. Do you cook on low for an additional 10 minutes after the initial 6 minutes on high or is it for 10 minutes total? For me, it was 10 minutes after the initial six. This is dependant on your grill and your chicken breasts, so please use a thermometer or a knife to cut into the breast to determine if it's done. I tried this recipe with a slight change. In the brine three spoons of curd was added. It came out well. Yes. Addition of curd in brine helps a lot in softening chicken. Further, it improves the flavour. I tried this recipe but I also relied on some information I found at http://www.virtualweberbullet.com/brining.html. According to that website, brining needs to be done at a high salt concentration for it to have any real effect. I used 1 quart of water with a 1/2 c. of kosher salt to brine about 2.5 lbs of boneless, skinless chicken breasts for about an hour. I then seasoned them according to this recipe. They turned out quite well and I will definitely try it again, probably with slightly less salt and/or less brining time. However, I can't imagine that a salt concentration as low as 1 T/quart would actually be effective. Too bad tou serve so many pop ups with your recipes. what we have here is a user failure / inability / inexperience to block pop ups. here is no different than anywhere else on the web. 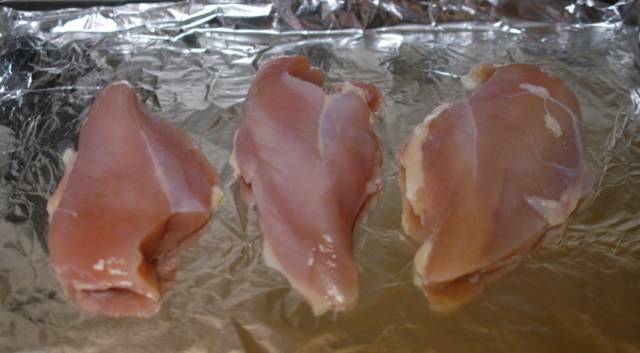 Is it ok to just put frozen chicken breast tenderloins straight into the brine, or does it need to be thawed first? Thanks. >>Is it ok to just put frozen chicken breast tenderloins straight into the brine, or does it need to be thawed first? Thanks. yup. keep refrigerated for anything more than 30 minutes or so. You can definitely thaw the chicken breast in the brine, but the duration of the soak time will have to be adjusted through experimentation. Can you use lite salt, for those on low sodium diets? Yes, but your chicken will be lower in sodium. do these cook well without olive oil? i don't think i've ever grilled chicken that wasn't rubbed in olive oil. does it affect the end result? I am prepping for a big party and am grilling 100 chicken breasts for a four hour OPEN HOUSE. Call me crazy!!?? I am a bit concerned about dry chicken. Can you brine, then drain and marinate? Or will marinate do the trick. If so, what would you recommend for timing. I planned on marinating the chicken for 24 hrs. prior to grill time. I have a grilled pepper lime chicken recipe with fresh lime juice/cracked pepper/hot sauce/onion marinate. I have Costco boneless skinless chicken breasts-I would like have some 'on deck' to place in the oven on warm, while I wait to restock chafing dish. 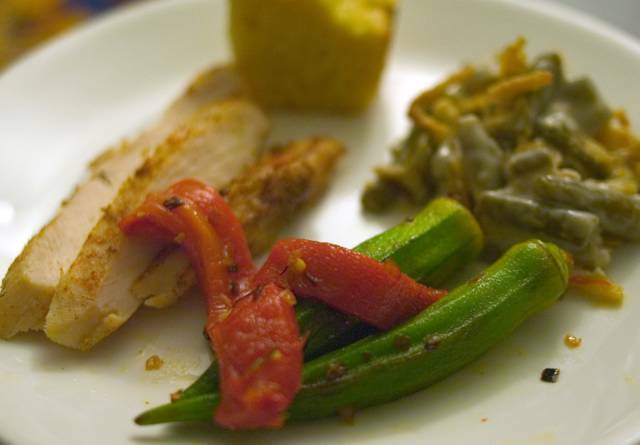 Does kosher chicken need to be brined? I seem to recall that salting is part of the kashering process. Kosher chicken is salted already. I don't recommend brining it full strength since it will taste overly salty then. You can try soaking it in plain water or water with a little bit of salt in it to "plump" it up before cooking. I used to do this, but took to using equal parts of salt and sugar. The amounts aren't critical. I only brine for a maximum of two hours, usually only one. Then I found out this can really be jazzed up by adding a key lime and clove of garlic, and smashing them with a mallet before adding the water. I usually don't add any additional spices and use an instant read thermometer to avoid over cooking. This worked well...finally chicken I can eat on my diet that is actually good. I had time to brine tenderloins for only half an hour. Will do it longer next time. The cayene and cinnamon make it look tasty too! worked out really well for me. I used a derivative of this recipe to make some oven-baked chicken strips. came out pretty well for my first time ever cooking chicken in an oven. the brine really helps. what effect would adding some kind of vinegar have? preparing the brine and stuff was a nice break from diff. eq. homework. lol. Subject: can we use a frying pan for this?